Mechanics Lesson #2 CCSS.ELA–LITERACY.L. 2 Demonstrate command of the conventions of standard English capitalization, punctuation, and spelling when writing. 3 Practice David has worked outside of the U.S. in many foreign countries, but he now works for N.A.S.A. 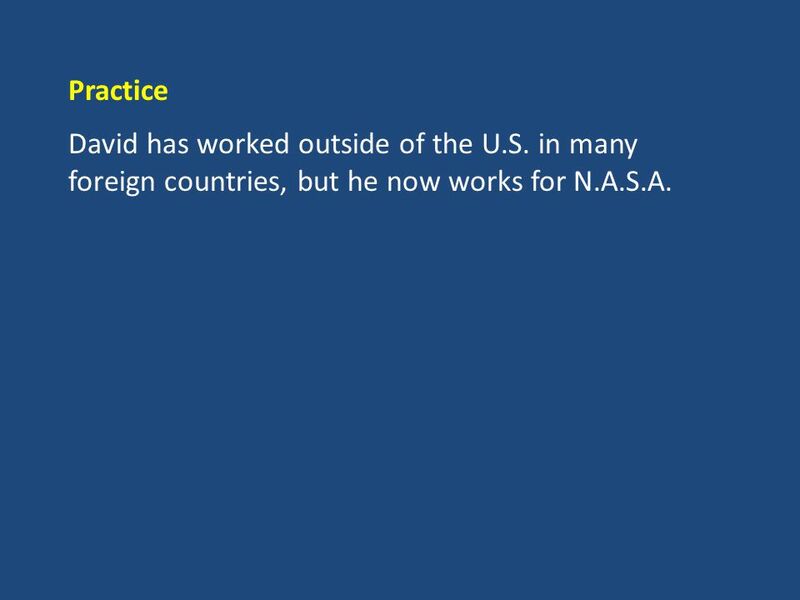 4 Practice David has worked outside of the U.S. in many foreign countries, but he now works for N.A.S.A. 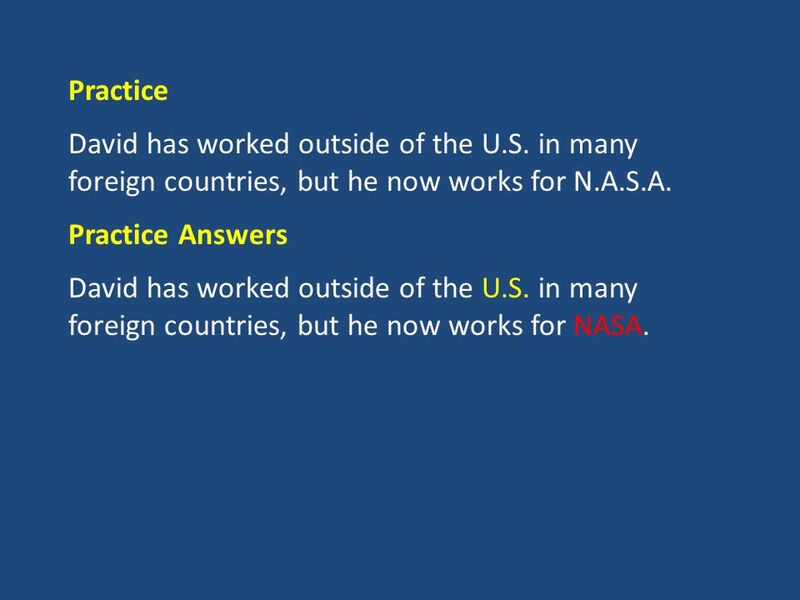 Practice Answers David has worked outside of the U.S. in many foreign countries, but he now works for NASA. 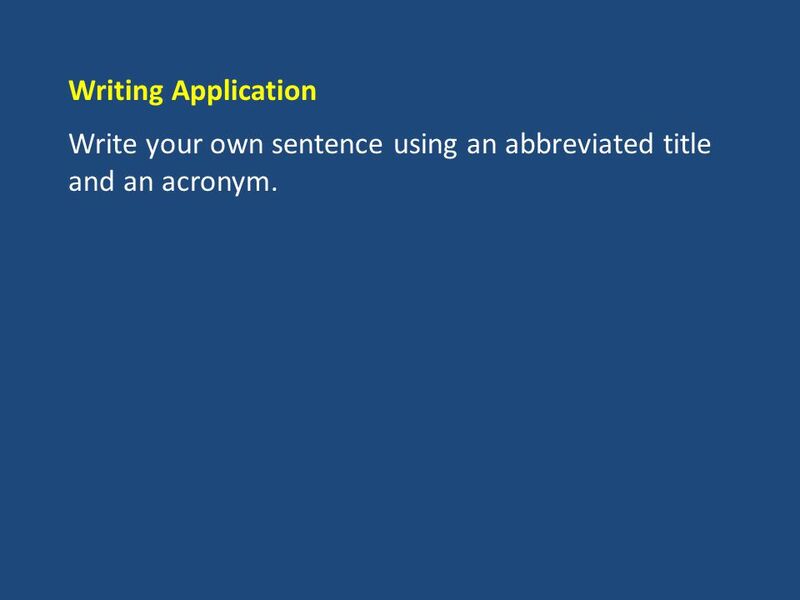 5 Writing Application Write your own sentence using an abbreviated title and an acronym. 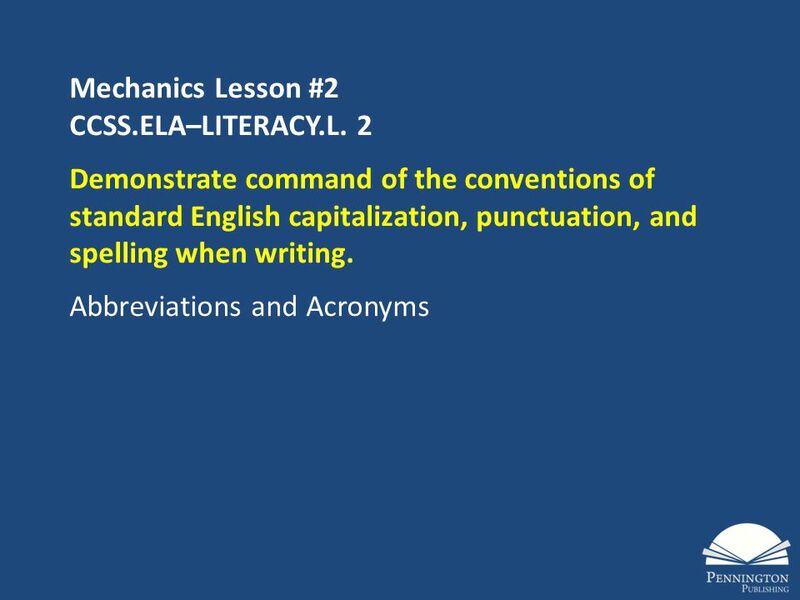 Download ppt "Mechanics Lesson #2 CCSS.ELA–LITERACY.L. 2 Demonstrate command of the conventions of standard English capitalization, punctuation, and spelling when writing." Does each sentence begin with a capital letter? Underline the beginning letter of each sentence. Is there a. ! ? after each sentence? Circle the punctuation. Session One of Two. Participants will gain an awareness of:  Content Organization  Content Movement  Vertical Alignment. Do I Understand the Keyboard and Typing? Assessment Game. Grammar and Usage Lesson #15 CCSS.ELA–LITERACY.L. 1 Demonstrate command of the conventions of standard English grammar and usage when writing or speaking. Mechanics Lesson #3 CCSS.ELA–LITERACY.L. 2 Demonstrate command of the conventions of standard English capitalization, punctuation, and spelling when writing. WELCOME TO EVERYBODY RAJ KUMAR SARKER. INTRODUCE Teacher’s name: RAJ KUMAR SARKER Assistant Teacher Katgara Govt. Primari School Sundorganj, Gaibandha. 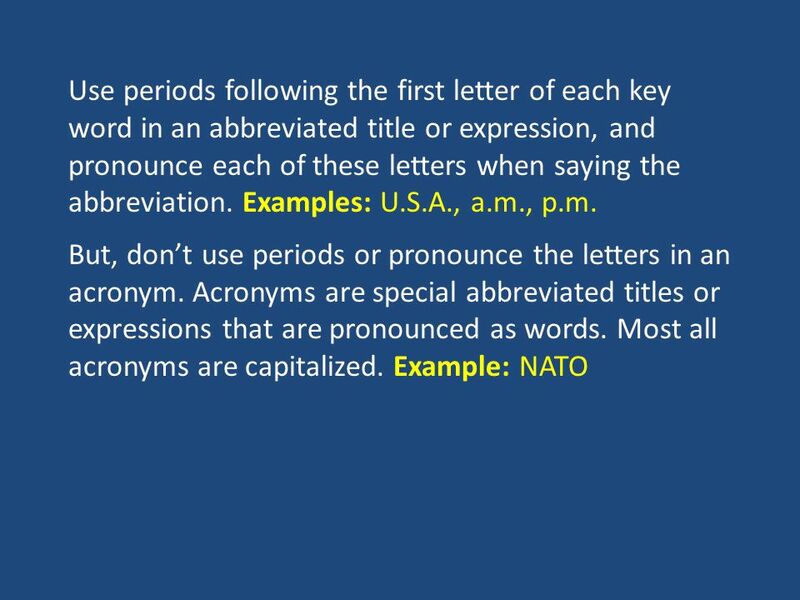 Grammar and Usage Lesson #42 CCSS.ELA–LITERACY.L. 1 Demonstrate command of the conventions of standard English grammar and usage when writing or speaking. Classroom language 1. You want to know the English word for 2. You don’t know how to pronounce a word. 3. You don’t know how to spell a word. 4. You don’t. Its not just for hip-hop anymore!! Alphabetic Indexing Rules OT 122 Chapter Two. Intro Must be a consistent system to work! Indexing? – Selecting the filing segment under which to store. Grammar and Usage Lesson #22 CCSS.ELA–LITERACY.L. 1 Demonstrate command of the conventions of standard English grammar and usage when writing or speaking. Grammar and Usage Lesson #23 CCSS.ELA–LITERACY.L. 1 Demonstrate command of the conventions of standard English grammar and usage when writing or speaking. By Mrs. Jacki Scholze. Hi, I’m Perky Pencil! I work in this school to help kids like you be better writers. Vocabulary Punctuation Study Guide. GLOSSARY: A glossary is a list of words and their meanings in alphabetical order. Questions and Exclamations Ashley Hamlin December 8, 2011 * Click the sound icon on each slide to hear narration. Revising and Editing. Revise vs Edit Revise vs Edit. ENRICHMENT – Quiz 3 Level A Language Conventions (Spelling) What is the correct spelling of the word?